2 New Holland 451 Sickle Mowers, 7 ft, ready to mow! 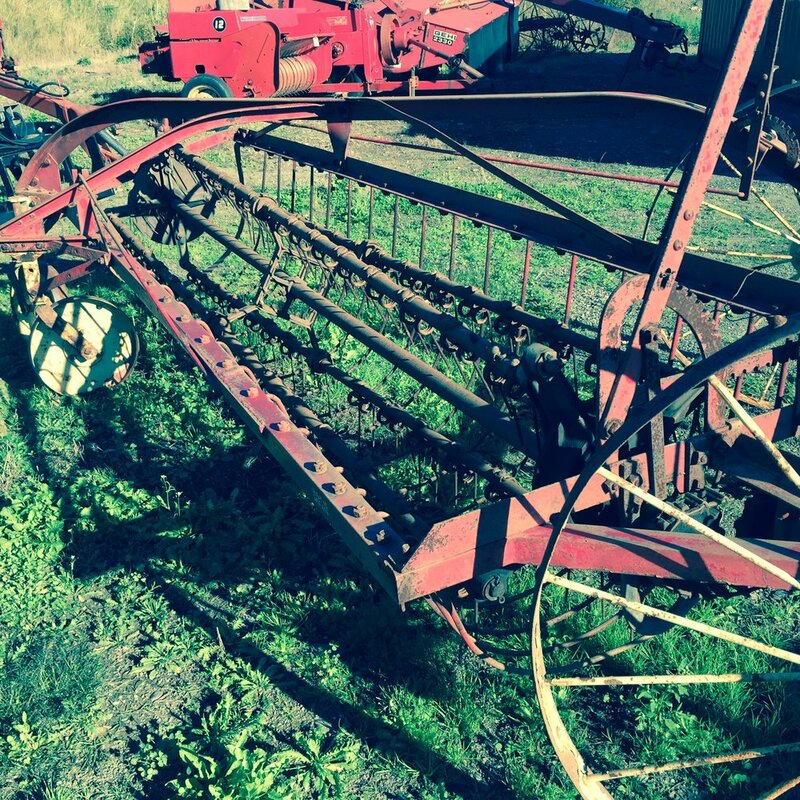 Kuhn GA 300 Rotary Rake, good working condition. Kuhn FC 353 GC Discbine Mower, 12 ft cut, center pivot, 1000 RPM, cutter head completely rebuilt with less than 50 hrs use, field ready. New Holland 1431 discbine, 2007, 13ft cut, rubber rolls, center hitch draw bar, swivel hitch, like new. New Holland 162 17ft Tedder. New Holland 1412. mower conditioner, with Flail conditioning. 10’ 4” cut. field ready. New Holland 70 Bale Thrower. New Holland 315 Baler, runs good, chains are good, ready to work. New Holland BR-740 Crop Cutter Round Baler, net and twine wrap. Stoll R315 Rotary Rake, 10 ft, 3 pt hitch. hydraulic, clean and ready to hay. New Holland #72 Hydraulic Bale Thrower, complete, just off NH baler. Good clean unit. Cockshutt #4 Horse Drawn 4 Wheel Hay Rake, working condition. New Holland 68 Baler, with 2 cylinder motor and PTO shaft, all refurbished. New Holland 163 hay tedder, hydraulic flip up rotors, ready to hay. New Holland 848 Baler, field ready, chains are in good shape and pick up heads. primed & painted, like new. John Deere 327 super sweep, long poll without thrower, field ready. New holland 273 baler, super sweep pickup head and long pole. This baler is in great shape and is read to go! New Holland 311 Baler with hydraulic thrower, completely reconditioned. New Holland 316 Hay Baler, bale thrower, All inspected & field ready. New Holland 565 Baler & Thrower, all hydraulic, clean and ready to hay. New Holland 311 Hay Baler and Thrower, hydraulic pan style, excellent condition with preserve tank, always barn kept. New Holland BC 5070 Baler with out bale thrower, ray for bale accumulator, like new, very little use, BIG BIG savings. New bale bunchers, 5- available built this winter. Balers, 40 on hand, ready for your haying. Call or come and look and pick yours out! NH, JD, INT, MF. Hay Elevator, 30ft with electric motor. Hay Elevator 16ft with electric motor and trans gear box, no belt. driven, new cutter bar, ready to go. good condition and field ready. Kuhn GMD 600 disc mower, 540pto, 7’10” width, all new knives, ready to go.